The word pueblo means village in Spanish, and over the years the word has come to stand for a type of architecture. When we think of a Pueblo Indian village we visualize a multi-storied apartment style building with a flat roofs. We also visualize adobe brick or stone and mortar construction. The Pueblo design is unique because the flat roof of one level serves as the floor and front yard of another. These different stories were connected by a series of ladders, and they were entered through a hole in the roof. 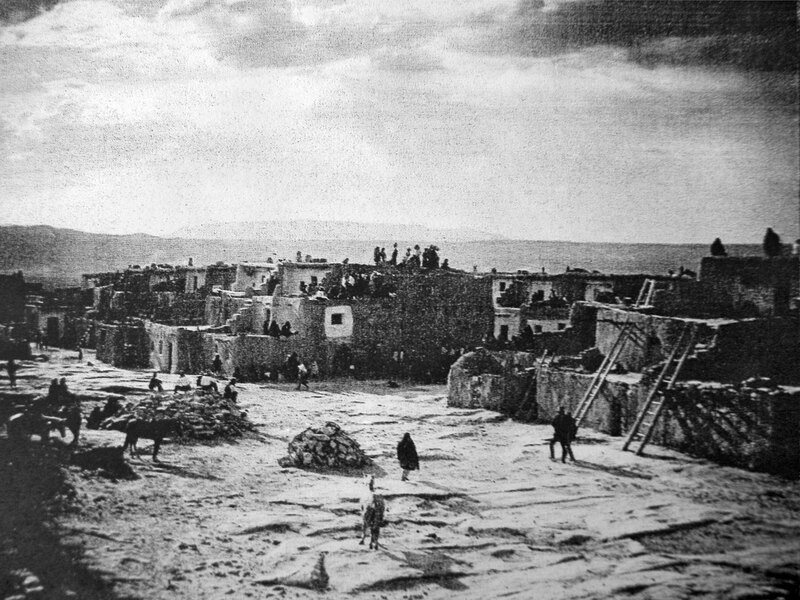 Both the Hopi and Zuni tribes are considered to be factions of the Pueblo tribe. The Pueblo are believed to be descendants of the earlier Anasazi and Mogollon cultures. It is also believed that they adapted many of their cultural traits from these people. This included building pit houses or kivas for religious ceremonial use. The Pueblo grew corn, beans, squash, tomatoes, cotton, peppers, and tobacco. They hunted rabbits, deer, and antelope. Also, the Pueblo domesticated dogs and turkeys for food. They used both cotton and deer skin clothing. The men wore kilts and the women wore dresses and sandals. The women made amazing pottery that came in many beautiful colors and designs. Pueblo men wore carved masks during religious ceremonies in an attempt to convince the gods to produce more rain. They also carved kachinca dolls. They used them to teach their children about Native American religion. 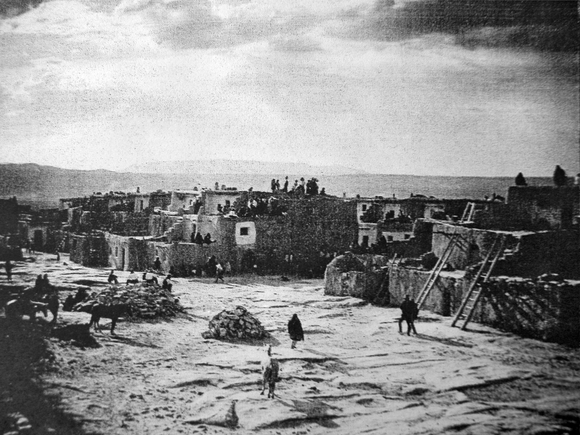 The Spanish explore Marcos de Niza was probably the first white European to contact the Pueblo/Zuni Indians. He was followed by Francisco Coronado in 1540. It is also probable that Alvar Nunez Cabeza de Vaca (the first man to walk across America) had contact with these people. Things really started to go bad for the Pueblo Indians after Juan de Ornate and 129 settles arrived to form the colony of New Mexico. It didn't take long before they established the first capital in Santa Fe. Ornate was vicious in the way he administered punishment to the Native Americans. At once he began a system of taxation, and forced slavery. He told them that they were subjects if the Spanish monarchs. Ornate completely annihilated the Keres Indians of the Acoma Pueblo when they rebelled against his harsh treatment. They would rise up in the great revolt called the Pueblo Rebellion of 1680. The Pueblo Indians were willing to tolerate the Spanish as long as they were allowed to practice their own religion in their kivas. When the Spanish began flogging the Pueblo for practicing their own native religion they rebelled. The leader of the rebellion was a Tewa Pueblo Indian named Pope. Pope carefully organized all of the Pueblos into action. Then on August 11, 1680 all of the Pueblo villages attacked at same time. They attacked haciendas, and soldiers and priests who were living in their village. The Pueblo killed scores of people. The Spanish soldiers managed to hold Santa Fe for several days before fleeing to El Paso, Texas. For the time being, the Pueblo had regained their homeland. Santa Fe was not recaptured by the Spanish until 1692. The Pueblo would remain under Spanish control until 1821. Then, in 1848, after the signing of the Treaty of Guadalupe Hildalgo was signed between the United States and Mexico, the Pueblo came under the jurisdiction of the United States Government.